A devastating discovery ends Marti Jenkins’ engagement. Now she’s ready to play the field for a while. A sidestep away from an angry rattlesnake lands her in the office of Whispering Springs’ new orthopedic doctor, Dr. Eli Boone. And yeah, he’s as hot as she’s been told. Dr. Eli Boone is only in town for six months covering his friend’s practice and then it’s back to New York City and into the societal world he’s lives. A widower for seven years, he’s not looking for a replacement wife, but he wouldn’t say no to a quick tumble in the sheets with the right woman. Due to ridiculous challenge he never should have accepted, Eli has to get over his discomfort around horses and learn to ride before he leaves town. He turns to the one person who can help him win the bet, Marti Jenkins. As he learns to ride a horse, Marti does a little riding of her own…and she doesn’t need a horse. This woman…this beautiful woman had a thing for him? His circulatory system shunted all his blood to his groin, which swelled with interest and desire. “Drake? What are you doing here?” she repeated. For an additional second, he reconsidered why he’d come. What if Leo had been wrong? Crap. What if he made a total fool of himself? “Great,” she said with fake enthusiasm. “Apology accepted.” She swept past him and climbed onto her porch. “Wait.” He followed her. “What’s his name?” he asked, stroking her dog’s head. The puppy squirmed in her arms. Drake leaned over and the animal licked his nose. “Her name is Killer,” KC said. “Can I?” Drake held out his hands to take the puppy. KC passed her over. “Killer? Why, this little lady doesn’t look like a killer.” He nuzzled the dog’s fur. The puppy darted her pink tongue out and tickled his face with tiny licks. Killer—Drake had serious doubts that was the dog’s real name—and he followed KC into the house. They stood in the foyer as she unclipped the dog’s leash. “Just water. I’ve had my beer quota for today.” They turned to the right and he followed her into a large, bright kitchen. “I haven’t.” She pulled a bottle of beer and a bottle of water from the refrigerator. “Nice place,” he said, taking the water and allowing his gaze to roam. The hardwood floor from the entry continued here. The dark gold and black granite countertops were set off by the glossy white of the cabinets. The black appliances complimented the black swirl in the granite. The area behind the sink opened up on the dining room just beyond it. Through that large opening, there was an expansive view of a golf fairway. He followed her through the adjacent dining room and then down three steps to a sunken living room. The room had a back circular wall comprised completely of glass, providing the view of the golf course he’d admired from the kitchen. He realized that the sunken room kept the incredible view available to anyone in the kitchen or the dining room. She dropped into a plush off-white leather recliner. Killer—that just couldn’t be this dog’s name—followed them, her nails clicking faintly on the hardwood. As soon as KC sat, the puppy stood on her hind legs to be picked up, which KC did. She stroked the dog’s head, sat back and waited. A large, butter-yellow overstuffed leather sofa beckoned to him. He sat and took a large gulp of water. First to dilute the beer floating around in his gut. Second, to put some moisture in his mouth and down his throat, both of which had turned to dust the minute he saw KC standing on her walk. And third, to buy him some time as he tried to find the words he wanted to say. He laughed. “Not exactly.” He leaned forward, his elbows on his knees. His movement caught the attention of the puppy, who jumped down and ran over to him. The ball of furry energy danced around his feet and Drake picked her up. If she weighed a pound, he’d be shocked. The puppy wiggled and climbed up to his face, again smearing it with her puppy tongue. At the mention of her name, the puppy’s head snapped toward her owner and she immediately began struggling to get down. Drake set Jazz on the floor and she scurried to KC, who shook her head and picked her up. “She’s rotten,” she said, but there was no fire behind her words. Drake leaned back on the sofa and crossed an ankle over a knee. “Okay, as I was saying, do you want to go with me on vacation? You sort of caught me off guard this afternoon, and I’m sorry for being so slow on the uptake. I’d love for you to come with me.” He drained the remaining water and set the empty bottle on the side table. “But you need to know that I reserved a one-bedroom suite. She drained her beer. The empty bottle dangled from the tips of her fingers. The side of her cheek sucked as she rolled it between her teeth. Everybody knows everything is hotter in Texas! Marti Jenkins is living life on her family ranch trying to get over a failed engagement. She doesn’t want or need a new man. However, all that changes when she meets the temporary “Doctor Hottie” that has all the ladies gossiping all over the small town. Dr. Eli Boone went to Texas knowing his position was a temporary favor for an old friend. After his wife died he’s never tried to find love, and doesn’t want to. But Marti Jenkins changes everything for him. 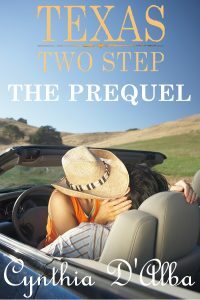 She’s independent, fiesty, and makes Eli realize that he may have a second chance at love. But with is position temporary, will these two allow things to burn hot for them in the Texas sun? I absolutely adored Marti! She’s a very independent, loyal, and kind of quirky woman. She’s confident and doesn’t take anybody’s crap. Pretty Cover and Hot Story! Author Cynthia D’Alba has written another fun and entertaining novel with Texas Daze, the ninth book from her Texas Montgomery Mavericks series. It is a nicely-paced read, replete with an engaging plot, two well-defined main characters, and a complicated, yet seductive romance. 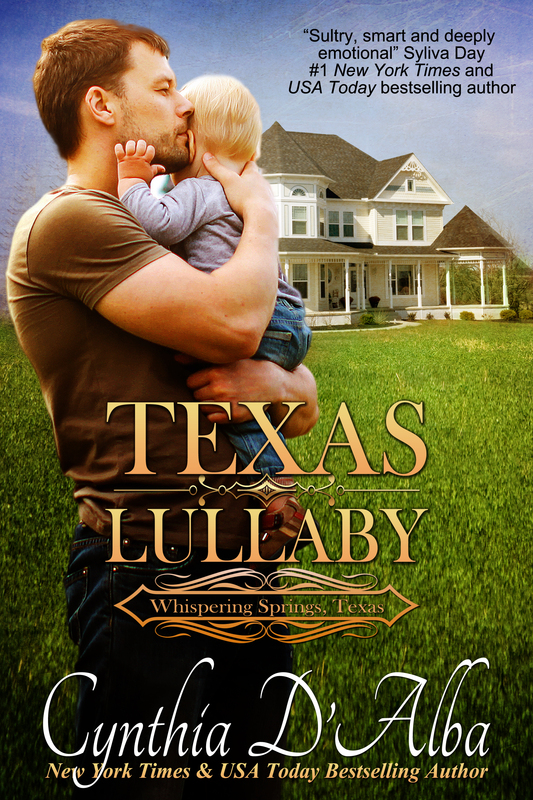 The story takes place in the small town of Whispering Springs, Texas, where finding true love is a bit challenging. Although this book is part of a series, it can be enjoyed as a standalone. Martha Gale Jenkins, aka Marti, is a genuine cowgirl. She loves being a rancher, and has completely immersed herself in her work while she picks up the pieces from a failed engagement. Lots of pain due to an injured ankle brings her to Dr. Eli Boone, the new but temporary orthopedist from New York City. Dr. Boone is smart, hot, and funny, and the attraction they share is undeniable. Marti and Eli are total opposites and they are not looking for a commitment, however, they end up spending time together which evolves from lust into love. Ms. D’Alba has become one of my favorite authors and I always enjoy her effortless writing style. This is an well-written story, and Marti and Eli are interesting, complex and genuine. They are a hot and fun couple, both in and out of the bedroom. If you enjoy a novel with a lot passion and energy, then pick up a copy of this book. Martha “Marti” Jenkins by stepping in a gopher hole had hurt her ankle in the pasture of her parent’s ranch. Still the work on the ranch needed done Marti was bound and determined to do it limping or not. Luckily Marti was able to finish but when her parents seen her ankle they noticed how bad it looked and talked Marti to seeing a doctor. So Marti begrudgingly goes and meets the hot handsome Dr. Elias “Eli” Boone who is just waiting for a job in New York City. Of course Marti keeps her attraction controlled she has been burned before. As Marti spends more time with Eli they can’t help the strong attraction they have for one another. When Eli gets the job in New York will he leave Marti for the job or stay in Whispering Springs Texas? I just love these feel good down home contemporary love stories. Sure the book’s cover is enticing but it’s Ms. Cynthia D’Alba writing that pulls you in with such an amazingly fantastic little story that can be read as a standalone not only can you see Whispering Springs Texas thinking it might be the greatest place in the world to visit but the wonderful characters literally come alive that sure I think I would even like to meet all them. Well excepting of course Debbie she kind of scared me especially since she is supposed to be a nurse but doesn’t sound all that caring. I seriously just loved Marti what a heroine! She was tough, sassy, and sarcastic but also had a sweet side and really cared for her friends. She wasn’t scared to put it to Eli or set him straight so it was hard to not only want to join her at Leo’s to have a drink and maybe dance with all the cowboys too. Eli was just a great hero sure he wasn’t perfect. Yes at times I wanted to shake him he didn’t tell Marti himself where he was going plus if you’re serious about someone you should give them your phone number especially since he needed a favor from Marti but his awkwardness was totally endearing. I am eager to read the rest in the Whispering Springs series or another of Ms. D’Alba’s stories! A great love story to escape into. Cynthia D’Alba writes hot cowboy stories. I am in love with her Montgomery men and Whispering Springs stories. This time, however, the wrangler is a woman, a real life cowgirl! Marti has been raised on the ranch, riding since she was two. Now her parents are taking an extended vacation and trusting her to oversee everything. This is what she has dreamed of her entire life. Eli is the new “hot doctor” in town. Marti has heard about him through the gossip grapevine, from her best friend Delene. When Marti is forced to go to the doctor and happens to meet “Dr. Hottie,” the sparks are obvious and immediate. Of course, he is only around temporarily, while the regular doctor is off at further training. Then Eli will go back to a prestigious position in New York City. Two attractive, intelligent and driven people with very different dreams, lifestyles and future plans. Is love strong enough to make them rethink their future? To make up for the sacrifices necessary for them to move forward together? I liked the obstacles that made theirs an unlikely love story. I liked the back story and history given for why each is single. It showed much about their character. And I could feel the attraction that does not want to be denied. Sign up for my newsletter to get the latest updates on books, upcoming events, and everything else! khaki shorts and nice polo shirt. He was not dressed for yard work. Maybe tomorrow. The sound of a children’s movie seeped through the door. He smiled and knocked. “I’ll get it,” a little voice said. The door flew open and Ellery and Annie stood there. “Uncle Jason,” they both cried. “I told you not to open the door,” Lydia said, marching up behind them. “But it’s Uncle Jason,” Ellery explained. family to the door and was now on the porch butting Jason for a scratch. “Welcome to chaos,” she said. He did and the kids sat down to watch a movie he was sure they’d seen no less than a million times. “Come on in the kitchen. You want some wine? A beer?” Lydia said. Lydia put Levi into his high chair and got out some baby food jars. “I’m going to feed him while we talk. “Sure. Let me do it,” he said. Levi gurgled, a drop of drool running down his chin. he jumped in, uncapping the jars. deposited the icky-looking mess in there. Levi immediately spit it out, splattering Jason’s clean polo. and the cutest grin he’d ever seen on her face. “Let’s try that again,” he told Levi. “I’ve got a surprise for you,” he said, spooning in another bite. He shoveled another tiny spoonful into Levi’s mouth. Before she could finish her sentence, the doorbell rang. “I’ll get it,” Ellery yelled. there,” she called back. “Not that she’ll listen to me,” she added, standing and hurrying out of the room.